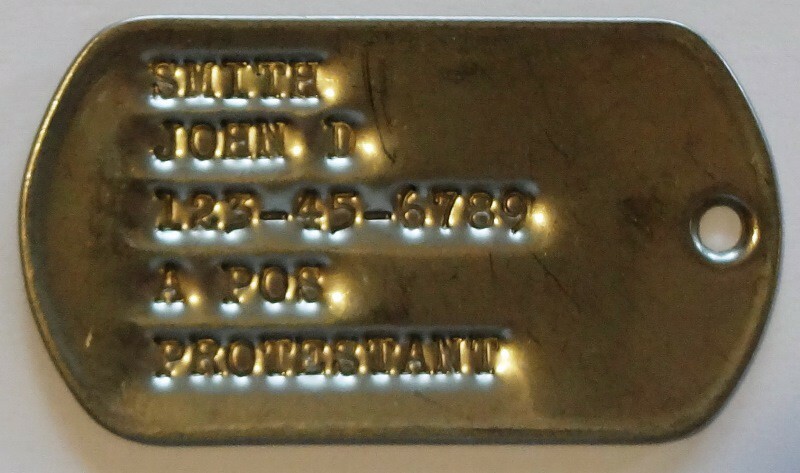 There are numerous styles and subtle changes made to dog tags from WWII through Vietnam. In this section, we will attempt to show the "most common" style for different time periods. 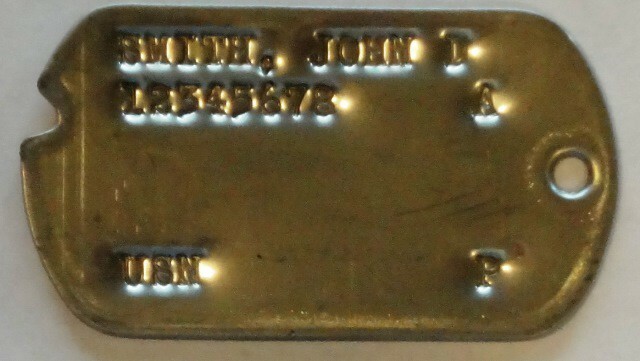 The main difference is the use of a "notched" tag or of a "regular" tag. 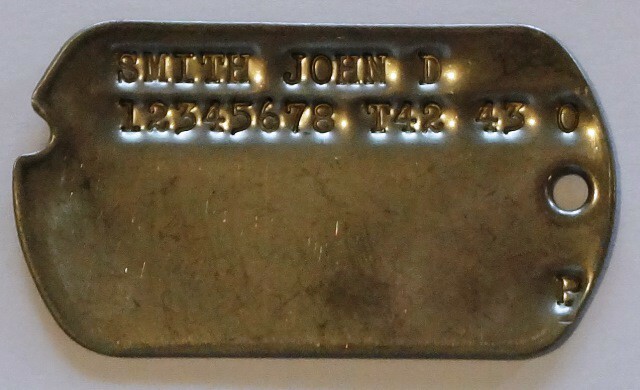 The notched were used from WWII until about 1964 when the regular tag was adopted. All tags are based on 5 lines of information with a maximum of 17 characters / spaces per line. 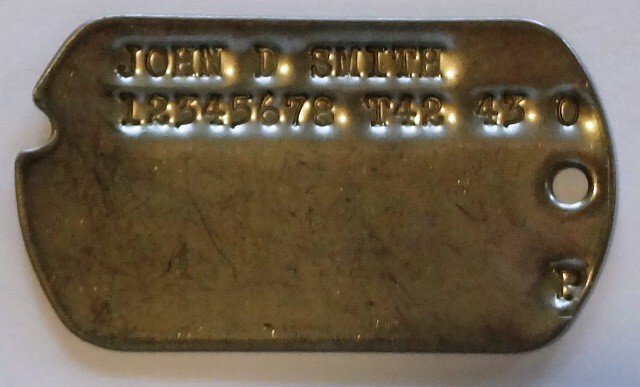 In WWII, the Army Service Number consisted of 8 digits based on status and geographic location. Also of importance is the fact that there is no Rhesus factor on the blood type ( + or - ) as this technology did not exist at the time. 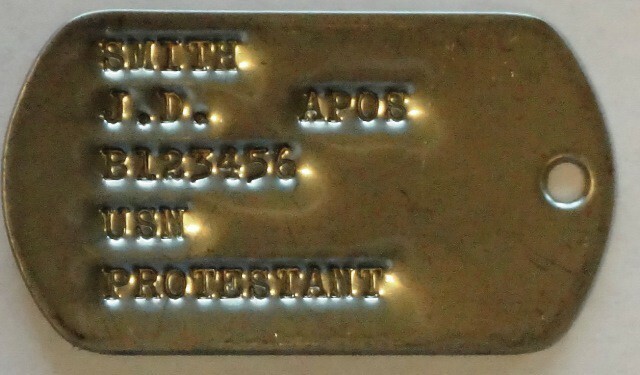 For religious preference, the tags were marked C (Catholic), P (Protestant), H (Hebrew) or left blank for no preference. 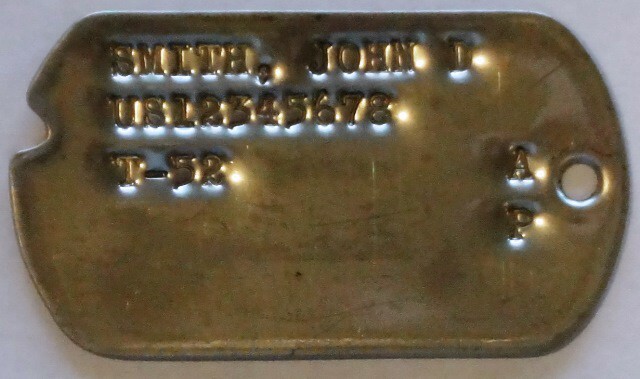 During the Korean War, there are several variations for tags, but the one below is the most commonly seen. 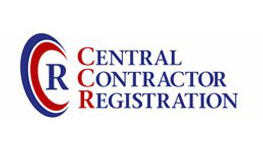 The Army began using the Service Number Prefixes: RA (Regular Army, volunteer enlisted), US (an enlisted draftee), NG (National Guard), ER (Enlisted Reserve), O (Officer) followed by an eight digit service number. Also of importance is the fact that there is no Rhesus factor on the blood type ( + or - ) as this technology did not exist at the time. 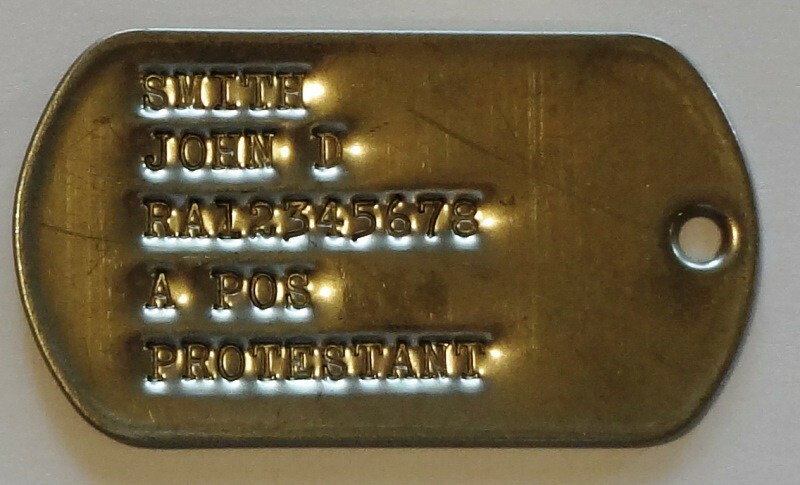 For religious preference, the tags were marked C (Catholic), P (Protestant), H (Hebrew) or left blank for no preference. 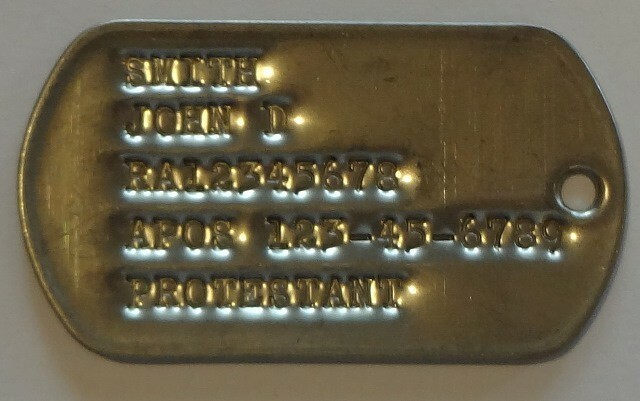 the Army Service Number was 8 digits and had one of the following prefixes: RA (Regular Army, volunteer enlisted), US (an enlisted draftee), NG (National Guard), ER (Enlisted Reserve), O (Officer). When using draftee designation "US", the first number is either a 5 or a 6. 6 was considered a bad number as it was reserved for the "Project 100,000". The second number is the "Army Area" the draftee was from. 1 or 2 indicated Northeast (after the 2nd Army was absorbed by the 1st Army in the 50's), 3 South, 4 Southwest, 5 Mid-West, 6 California, Pacific Coast, Hawaii, Alaska. 0 indicated outside the US such as Puerto Rico, Virgin Islands, or America Samoa. Of interest, is that US67 numbers indicated one of McNamara's Project 100,000 draftees who had failed the Armed Forces minimal IQ test, but were drafted anyway to meet the manpower needs. The Army used the Army Serial Number exclusively until the end of 1967 when the use of Social Security Numbers (9 digits) was introduced. 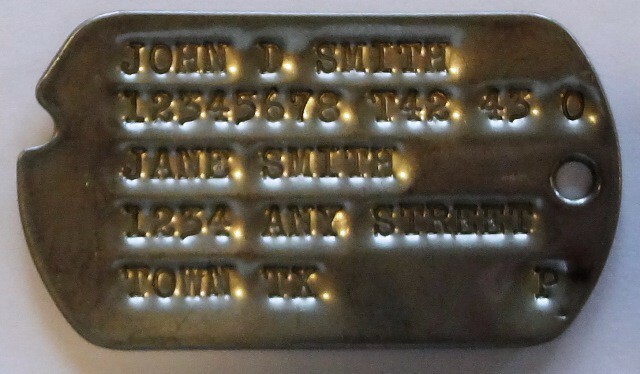 From this time until June 1969, many dog tags used both numbers. After this date the Social Security Number was used exclusively. 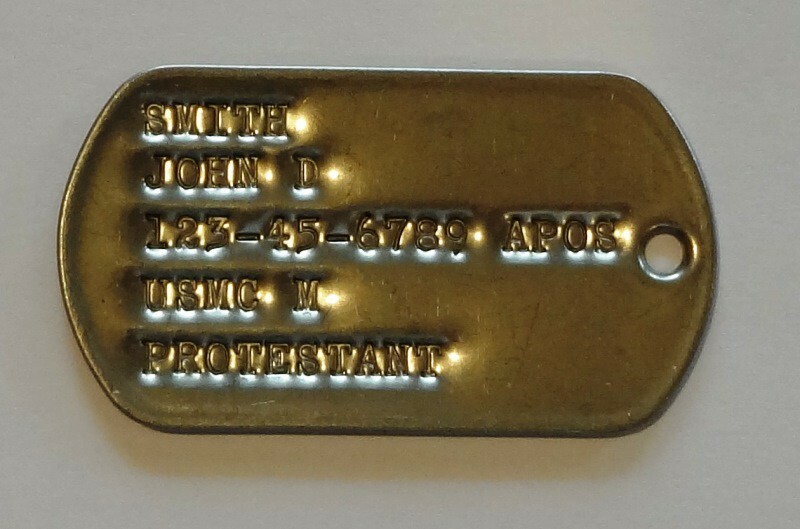 For Vietnam Era tags, you also see the use of the "broad" religions such as Catholic, Protestant, Hebrew fully spelled out as opposed to the first letter on WWII tags. You also see many tags with specific main stream denominations such as Baptist, Presbyterian, Methodist, etc. During this time, if you have no religious preference, the tags are typically stamped "NO PREFERENCE" or left blank. *Special Thanks to Brad LaGrange and Lee Russel for providing the above information on service numbers. there seems to be many variations that are not as "straight forward" as Army tags. 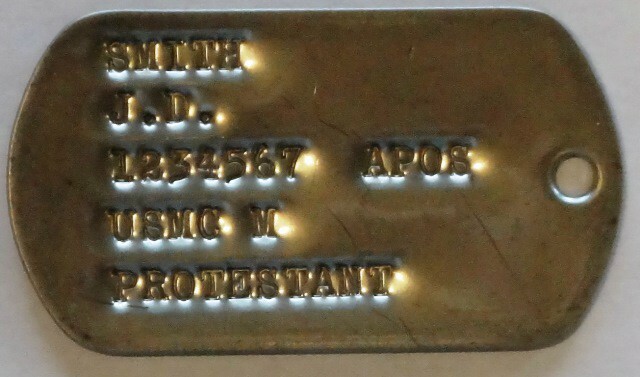 The last name is on the first line and the second line either has both of your initials, or your first name and middle initial. For the third line, the Marines used service numbers which could be 5, 6, or 7 digits. Fourth line is USMC followed by gas mask size. The sizes are XS,S,M,L,XL. Fifth line for religion is fully spelled out such as Protestant, Baptist, Methodist, Catholic, Episcopal, Hebrew, etc. First Initial & Middle Initial J.D.